The Peace & Body Roll Duo BOOMscat is coming to Baltimore! 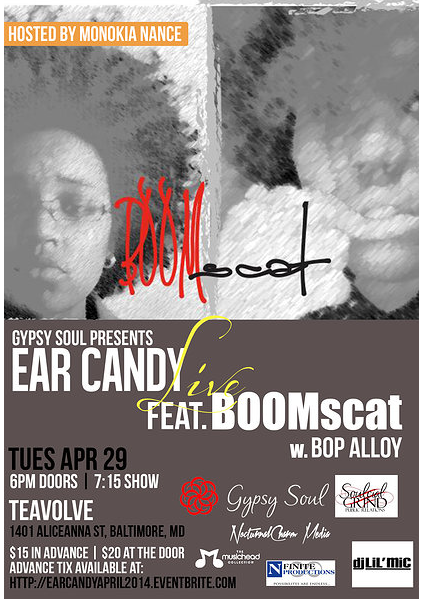 Get tickets to see The Peace and Body Roll Duo BOOMscat at Ear Candy! In less than two years, this talented duo has had crowds doing the body roll at live events and blessed us with a FREE DOWNLOAD of their first project, “Trilogy“. Make sure you get your copy and also download their latest project, “The West Wing Project” too! Please join our Fan Page on Facebook and follow The Mellow Mix Family on Twitter at @TheMellowMix @Shani_Elliott @TheRealCynDiva & @TraiChic @DJHarveyDent @VBrinkley513. Tags: "The Mellow Mix", "The West Wing Project", @BOOMscatMusic, @DJHarveyDent, @shani_elliott, @TheMellowMix, @therealcyndiva, @traichic, @VBrinkley513, BOOMscat, CynDiva, Shani Elliott, The Peace & Body Roll Duo BOOMscat, Trai Chic, Trilogy, Vance Brinkley. Bookmark the permalink. Previous post ← Are you going to DC Love Fest? You Better! See @ChrisetteM @MosDefOfficial and More!